If you’re looking for a fun, impressive manicure, look no further. Tribal print manicures can be pretty impressive, but also pretty hard to accomplish. The amount of detail involved can prove tricky for even the most accomplished manicurist. Have no fear – I’ve found a solution. All you need for this manicure? Your favorite polish and a Sharpie. 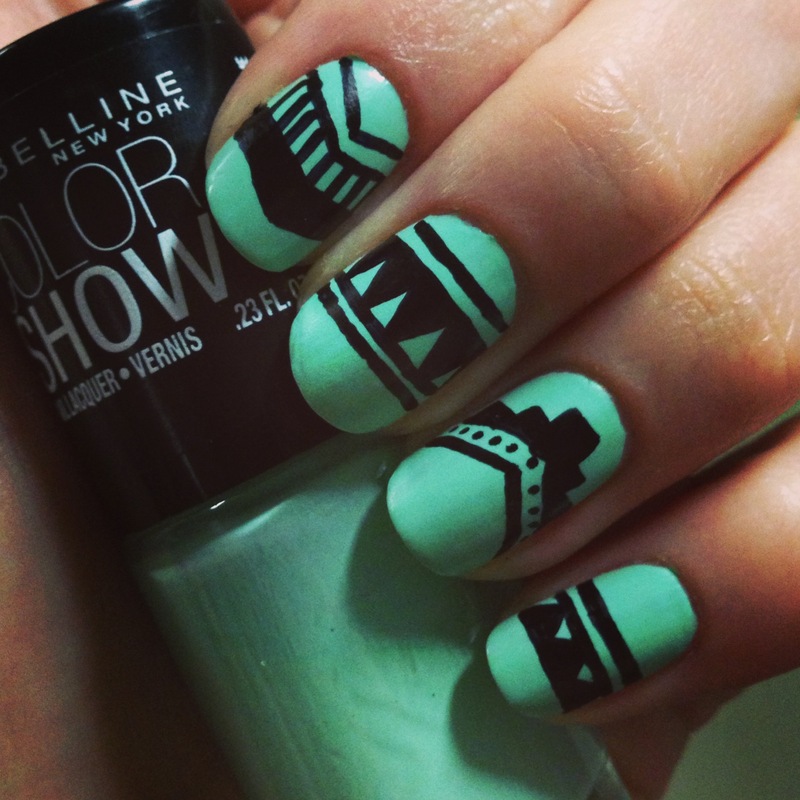 A complete tribal manicure with as little effort as a simple sketch. Read on to learn how to get this manicure yourself! Start out this manicure, as with any manicure, with clean nails and your favorite base coat. I can’t stress enough how important a base coat is to your manicure. I’ll be the first to admit that my nails take a beating when it comes to how often I polish, remove, and polish again, but Nail Tek II keeps my nails looking and feeling healthy and strong. Pick your favorite polish for your base color. I’d suggest something bright and bold that will stand out against black. I went with Maybelline Color Show Nail Lacquer in Green with Envy, a pretty mint color. After applying two coats of this color, I decided I wanted to make it matte. I added a coat of NYC’s Matte Me Crazy Mattifying Top Coat to each nail and absolutely fell in love. I almost didn’t want to add any details! The secret to this easy tribal print is a Sharpie. Yep, you read right – a permanent marker. Make sure your nails are totally dry before drawing on them because you don’t want to smudge the polish. I actually waited until the next day to begin the details. While your nails are drying, plan out your design. It will help to have it drawn out on a piece of paper so you can follow that as you draw. This way, you know exactly what tiny details are going on each nail. Once you’re ready, get to drawing! Just draw the designs with the Sharpie directly onto your nail as you would on a piece of paper. Wait for your Sharpie design to dry totally before finishing with your favorite top coat to seal it in! If you added matte like I did, use your matte top coat again to keep the look matte.